High Current Contacts for Galvanising EquipmentMuch emphasis is being placed on the quality of finishing and plating galvanising and electroplating. These increasing requirements are simultaneously combined with the demands for inexpensive methods and rational, low-maintenance production procedures. 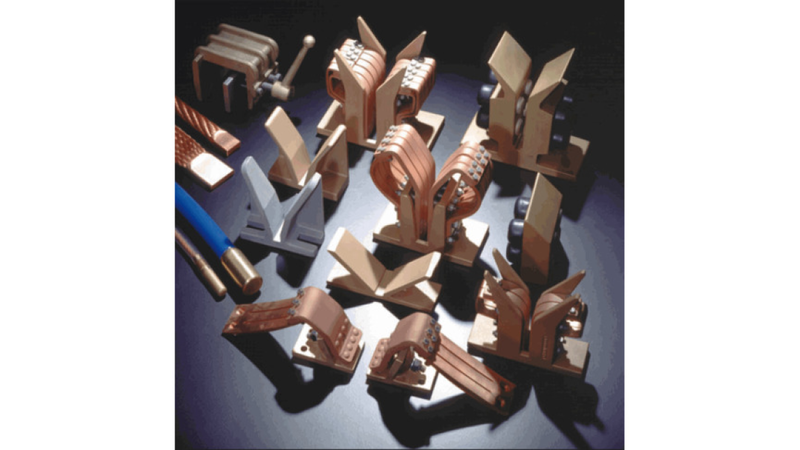 Every component of a plating system must therefore be equipped to meet these prerequisites. Weak points which can be the cause for repairs or system down-time could lead to plating problems must be avoided or eliminated. A major prerequisite for optimal processing is that the current required must be transferred to the items in the vat with as little loss as possible. This factor clarifies the emphasis on transfer mediums and contacts within the system. After a decade of experience in the construction and production of high current contacts, Druseidt has gained an understanding of this statement and the problems that occur in these applications. The experience gained, combined with the most up-to-date construction and production systems have made our company into a competent partner for system manufacturers as well as for end users. We offer a complete service palette including consulting and planning, production and delivery right through to installations or moving and reinstalling at the customer site. A full selection of contact systems as well as a multiple of accessories and electrical transfer elements for anodising and galvanising equipment is found in this catalogue. In addition to our extensive standard products, we offer customer specific solutions which are adapted especially for your requirements.